Love has been used, reused and abused for the sake of art. It can be subtle, obvious or on your face. This “love” might be more expensive than a divorce settlement, can break a county museum’s budget or be at the subway station one morning and stolen that night. There are beautiful ways of showing love through art and I am sure each one of us have a favorite one hanging at a museum or your living room. There may be pieces less than $20 puchased under the Eiffel tower or priceless like Robert Indiana’s sculpture in NY. Love for art is another story. But for this weeks challenge, Love is nothing but a word, a symbol, a theme, an interpretation or an act, for the purpose of producing art and making money. And for this I chose Damien Hirst’s piece showed at the recent LA Art Show. This one I believe is from his earlier show, In and Out of Love (Butterfly Paintings and Ashtrays). Damien Hirst, has recently been in the news for “killing” more than 9,000 butterflies for the sake of art. 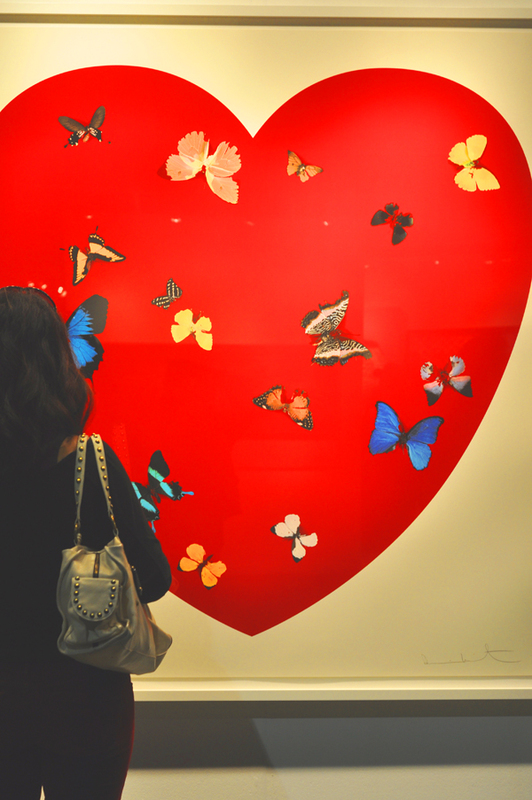 This entry was posted in Flash and tagged art, damien hirst, heart, love, postaday, weekly photo challenge. Bookmark the permalink.